My poll was a success! Thanks, everyone who voted. While black had a strong showing near the end, iridescent won the day, rather to my chagrin as I haven’t really drawn anything iridescent before… I think it worked out reasonably well, though not perfectly. I based the iridescent part on one of the pearls in this picture. Mermaids associate the colors pink and red most strongly with weddings and brides, possibly due to red seaweed being a traditional bridal decoration. Pink has a rather old-fashioned feel and deep reds display the family’s wealth, because the deeper the color is, the harder it is to waterproof successfully, and so dark or rich colors weren’t available until more recently and they’re more expensive. These days, mermaid brides tend to choose a shade between pale pink and blood red that they think best suits their tail. (This means that mermaid bridesmaids grumble more than human ones if the bride insists on their wearing the same color; the green-tailed mermaid does not like the poppy red that sets off the bride’s black tail so well, and the mermaid with the light yellow tail feels washed out in the pale pink favored by the silver-tailed bride.) Pearls are also traditional wedding decorations, and a moderately priced rope of white pearls serves much the same function at a mermaid wedding as a toaster does at a wedding for American humans. Different-colored pearls, particularly black and rose ones, are most valued. Red seaweed is, of course, very popular, although seaweed of every type might be used much as humans might use flowers. Depending on where a mermaid lives and on the fashions, other flowers are popular; water lilies are often used in some areas, and tropical flowers such as hibiscus might be more popular in others. Not all mermaid wedding dresses are tattered, but it’s as hard for mermaid designers to resist as lace is for human ones, because of the strong romantic overtones. For the veil, you will want to cut a straight line between the bottom of the crown, underneath the seaweed, and the veil. This way the doll’s head can be poked through. OMG! This is beautiful! I love how the tail fin is different on every Mermaid! Mermaid monday is ace! I agree with everyone! You rose to the challenge and transcended it! Librarian me loved the educational nugget about the red seaweed; but the by play about bridemaid conflict just cracked me up! 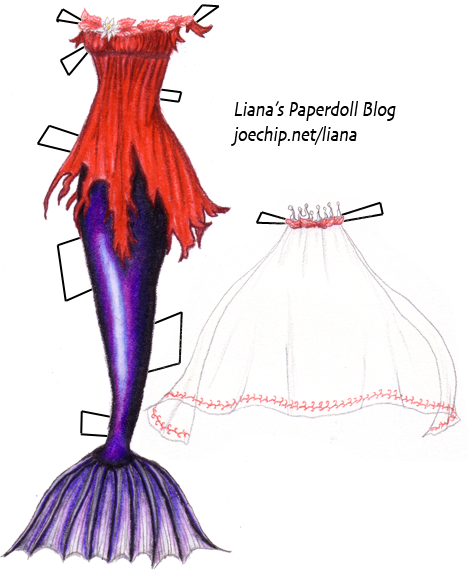 I hope someday you get to publish a mermaid paper doll book with all the story line as well. Good stuff for kids and grown ups! this would be perfect for my halloween costume!Can I make this?! I mean I would make the top and add a pair of leggings! All right would go to you as the designer I would just sew it!